Cardiogenic Shock with Complete Atrio-ventricular Block in an Octogenarian Woman: Are we going too far? Cardiology Department, University hospital of Caen, Avenue cote de nacre 14033 Caen, France. Dahdouh Z, Lemaitre A, Roule V, Troussard V, Grollier G. Cardiogenic Shock with Complete Atrio-ventricular Block in an Octogenarian Woman: Are we going too far? Oman Med J 2014 May; 29(4):299-301. We report a case of an octogenarian woman who suffered from cardiogenic shock following an inferolateral myocardial infarction extending to the right ventricle associated with complete atrioventricular heart block. Her initial status was critical with a poor prognosis. She requested an invasive full management to be able to continue to take care of her ill husband. She was managed with circulatory assistance, temporary pacing and percutaneous coronary intervention. The procedure was successfully performed and the patient showed a remarkable improvement in clinical condition. Cardiogenic shock complicating right heart ventricle in elderly requires careful patient selection for invasive strategies that can sometimes rely on the willingness of the patient, as the procedural outcome appears to be poor in this high-risk population. Keywords: Cardiogenic shock; Octogenarian; Percutaneous coronary intervention. Post-myocardial infarction cardiogenic shock (CS) still carries a very poor prognosis despite of the rapid management using effective strategies of myocardial revascularization.1 It has been shown to be a strong independent predictor of early- and-late mortality.2 Yet, the elderly who developed CS were significantly less likely to have undergone cardiac catheterization, percutaneous coronary intervention (PCI), or coronary artery bypass surgery and to have received intra-aortic balloon pump (IABP) with advancing age.3 So, in this category of patient, the trends are rather to “slow down” the invasive management. We present herein a case of an octogenarian woman with CS that was managed “aggressively” with a favorable clinical outcome. An 83-year old woman with a history of hypertension, hypercholesterolemia, atrial fibrillation and hypothyroidism was admitted for CS secondary to an inferolateral myocardial infarction extending to the right ventricle with third degree atrioventricular heart block. Electrocardiogram showed ST segment elevation myocardial infarction (STEMI) in the inferior (DII, DIII and aVF), and lateral (DI and aVL) leads. Systolic arterial pressure (SAP) was 90 mmHg, and heart rhythm was 35 beats/mn. The patient requested an invasive full management and insisted that she must go home “healthy” to be able to continue to take care of her husband who was suffering from severe Alzheimer disease. Cardiac ultrasound showed normal left heart function (left ventricular ejection function at 80%), but a dilated and hypokinetic right ventricle. Computed tomography showed no signs of pulmonary embolism. 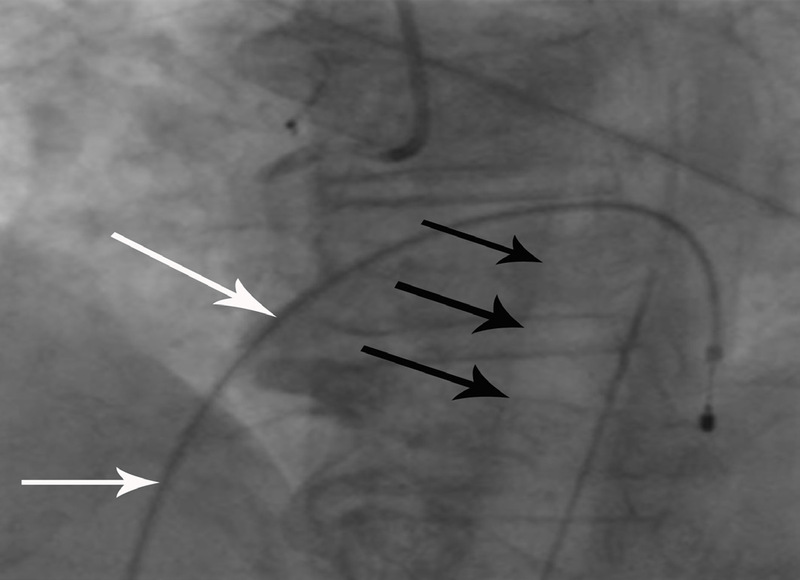 Figure 1: Temporary pacing (white arrows) and intra-aortic balloon pump (black arrows) were inserted before the percutaneous coronary intervention. The patient was taken to the catheterization laboratory where temporary pacing was set up through right femoral vein, and an IABP (Figure 1) was installed through right femoral artery. 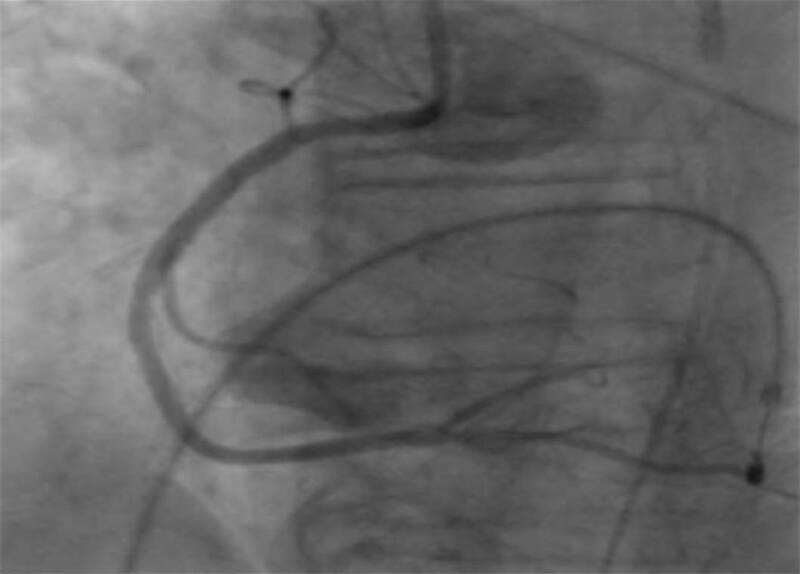 Coronary angiography by right transradial approach showed very proximal thrombotic occlusion of a dominant right coronary artery (RCA) (Figure 2) that was partially supplemented by retrograde path from a left coronary system, which was roughly infiltrated with no significant main branches stenosis. Percutaneous coronary intervention (PCI) of the occluded RCA using a Bare Metal Stent (Integrity 3.0 mm × 30 mm, Biotronik, Erlangen, Germany) was successfully performed (Figure 3). Hemodynamic parameters improved quickly after the unclogging of the RCA and SAP rose to 110 mmHg. The patient showed a remarkable improvement, and restored spontaneous sinusal rhythm at 70 beats/mn. Pacing probe and IABP were removed at day three, and the patient was discharged at day six. Medical treatment was continued and she followed a rehabilitation program. The function of the right ventricle normalized and the patient remained symptoms’ free at one year. She was fully satisfied that she came back at home and was able to take care of her sick husband. Figure 2: Proximal thrombotic occlusion of the right coronary artery. 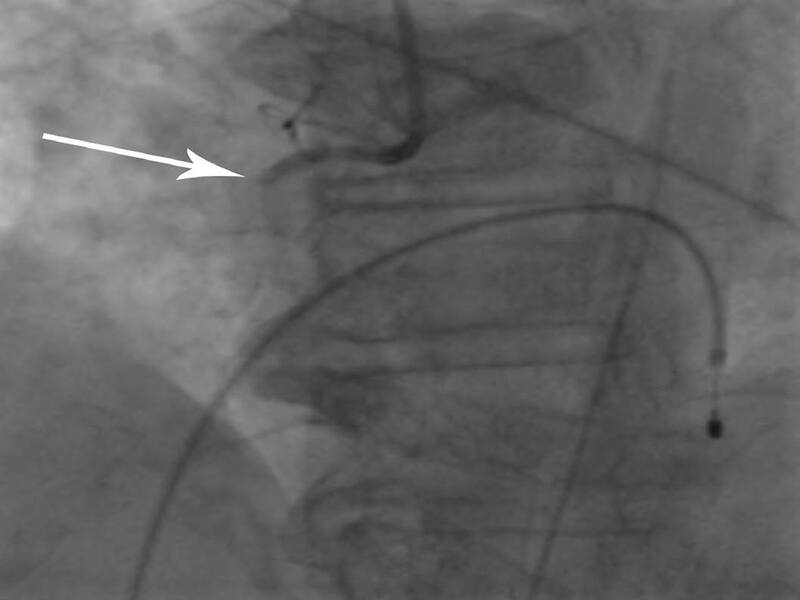 Figure 3: Right coronary artery after the percutaneous coronary intervention using a Bare Metal Stent (Integrity 3.0 mm × 30 mm, Biotronik, Erlangen, Germany). Moreover, it has been reported that primary PCI in the setting of STEMI is efficacious and safe in octogenarians with a procedural outcome comparable with younger patients.7 Another report observed no difference over a 6-year period in early and 1-year post-discharge mortality in elderly STEMI patients.8 The subgroup of elderly patients presenting with acute coronary syndromes represents a continuously growing population with the highest risk for complications and death. Furthermore, they are the patients who may have a better absolute benefit from reperfusion treatments when compared with younger patients.9 So, we can anticipate that outcomes will be better among those patients treated by guideline-recommended care, which in the case of CS involves an invasive strategy. In this case, the medical team agreed about the severity of the initial clinical prognosis, but opinions were divergent regarding the management ranging from palliative care to an invasive strategy assuming a possible recovery of the right heart. In such situations, the opinion of many clinicians worldwide will be to manage conservatively without invasive interventions. Furthermore, as we saw in our particular patient, the invasive strategy including temporary pacing, IABP, and PCI was carried out and was life-saving. This case may raise the question of the feasibility and outcome of PCI in very old people presenting with CS complicating right heart ventricle infarction. At this time, careful patient selection for invasive strategies is recommended as the procedural outcome appears to be poor in this high-risk population. Moreover, we might consider a more invasive treatment for older individuals on a case-by-case basis, and sometimes we can rely on the willingness of the patient. 1. Leprince P, Bonnet N, Varnous S, Rama A, Ouattara A, Makri R, et al. [Post-myocardial infarction cardiogenic shock and circulatory assistance]. Arch Mal Coeur Vaiss 2005 Nov;98(11):1090-1094. 2. Marcolino MS, Simsek C, de Boer SP, van Domburg RT, van Geuns RJ, de Jaegere P, et al. Short- and long-term major adverse cardiac events in patients undergoing percutaneous coronary intervention with stenting for acute myocardial infarction complicated by cardiogenic shock. Cardiology 2012;121(1):47-55. 3. Goldberg RJ, Spencer FA, Gore JM, Lessard D, Yarzebski J. Thirty-year trends (1975 to 2005) in the magnitude of, management of, and hospital death rates associated with cardiogenic shock in patients with acute myocardial infarction: a population-based perspective. Circulation 2009 Mar;119(9):1211-1219. Published online 23 Feb 2009. 4. Centers for Disease Control and Prevention (CDC). Trends in aging–United States and worldwide. MMWR Morb Mortal Wkly Rep 2003 Feb;52(6):101-104, 106. 5. Sukiennik A, Król A, Jachalska A, Koziński M, Fabiszak T, Kubica A, et al. Percutaneous coronary angioplasty in elderly patients: Assessment of in-hospital outcomes. Cardiol J 2007;14(2):143-154. 6. Chait R, Zad O, Ramineni R, Shukla A, Mitchell A. Midterm outcomes and quality of life following percutaneous coronary intervention in nonagenarians. Am J Cardiol 2011 Jun;107(11):1609-1612. 7. Murphy JC, Kozor RA, Figtree G, Hansen PS, Rasmussen HH, Ward MR, et al. Procedural and in-patient outcomes in patients aged 80 years or older undergoing contemporary primary percutaneous coronary intervention. EuroIntervention 2012 Dec;8(8):912-919. 8. Lazzeri C, Valente S, Chiostri M, Attanà P, Picariello C, Gensini GF. Trends in mortality rates in elderly ST elevation myocardial infarction patients submitted to primary percutaneous coronary intervention: a 7-year single-center experience. Geriatr Gerontol Int 2013 Jul;13(3):711-717. 9. Skolnick AH, Alexander KP, Chen AY, Roe MT, Pollack CV Jr, Ohman EM, et al. Characteristics, management, and outcomes of 5,557 patients age > or =90 years with acute coronary syndromes: results from the CRUSADE Initiative. J Am Coll Cardiol 2007 May;49(17):1790-1797.